Four stories. Four African American icons. Four powerful contemporary leaders. 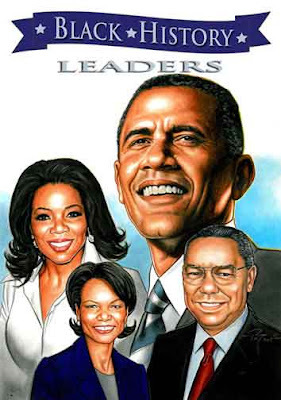 BLACK HISTORY LEADERS is a compilation comprised of four Blue Water comics featuring President Barack Obama, Condoleeza Rice, Colin Powell and Oprah Winfrey. I got the book after Black History Month last year and held it just for February 2011. Ultimately, his introduction as a character deflected the story away from these women and distracted the reader from the women he was showcasing rather than enhancing the narrative. Not only is that a disservice to these power brokers, but considering the huge hurdles women go through for equality, it disingenuous. While some of the biographers took a similar approach in BLACK HISTORY LEADERS by inserting themselves into the comics textually and artistically, their presence was much less intrusive. I enjoyed this book much more. Successes and failures, tragedy and triumph are in the forefront of these stories. Students will soon find out, if they did not already know, that Oprah Winfrey was molested as a child. All of these stories start with humble beginnings, leading to the power of education and determination. It is the social dream promoted in schools and will fit in well with state standards. BLACK HISTORY LEADERS speaks directly to persons of color by showcasing the incredible impact contemporary African Americans have had on society. The fact that most of them came from humble beginnings gives hope to all students of any color that they can go far in this world despite roadblocks, discriminatory laws, or abusive families. Where does a reviewer begin? Studies show that boys tend to like nonfiction more than fiction. If one is trying to engage male readers, then biographies (especially when they include information about war) may be helpful. If one wants to spotlight significant modern African Americans, then this has a lot to offer. Of course, a feminist studies class would benefit from the stories of Oprah Winfrey and Condoleeza Rice. With the four leaders, a teacher could easily use a Jigsaw (a Kagan Cooperative Learning structure). Students are placed in Home Groups. Each students decides which specific aspect of the research project he or she will study. In this case, students would pick one of the four leaders. Let’s use Oprah. One member of the Home Group will choose to study Oprah. The students would then break up and meet with others who have elected to study the same leader. All the Oprah students from all the Home Groups would meet together and study Ms. Winfrey, recording all of the important or interesting information. After the research is complete, the Oprah Group would split up and join their original Home Group. The Oprah expert would then teach each member of his Home Group all about Oprah. Each student in the Home Group would do the same. The Home Groups could then create a poster board, magazine, brochure, Power Point presentation, website, wiki or comic about what they have learned. Not only is this approach student centered, but it is contemporary society. If a student creates an end project, then communication arts standards can also be applied to a mainly social studies event. Lettering: Jaymes Reed and Wilson Ramos Jr.